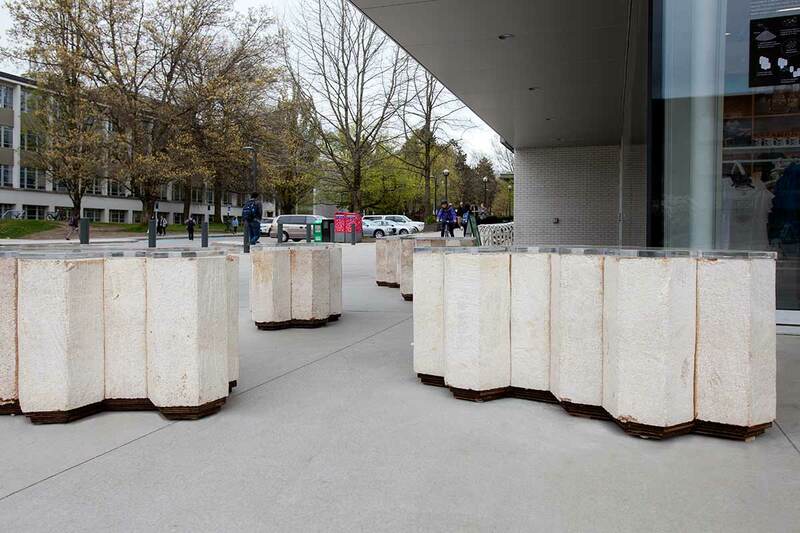 They Grow Without Us was an installation of biodegradable public furniture on the UBC campus by AFJD that engages innovative interdisciplinary research at the intersection of materials science and design. 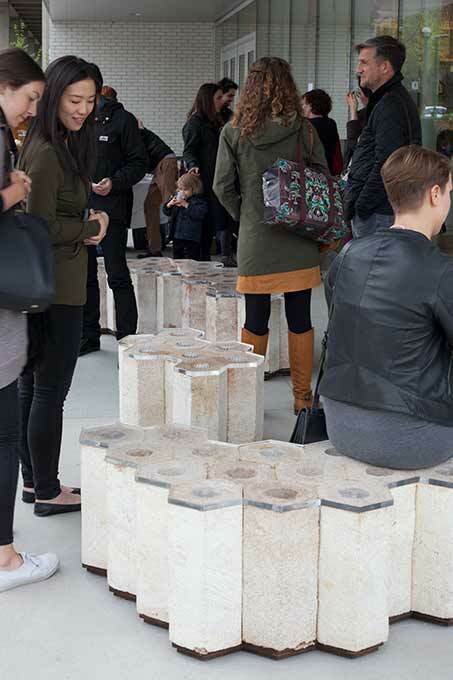 The pieces consist of honeycomb-shaped public furniture grown from mushrooms. A blend of mushroom spores and sawdust were cultivated in moulds, which are then dried to produce solid objects. The honeycomb design of the seating reflects a fabrication process in which individually moulded hexagonal blocks are grown together to produce larger forms. Mycologist Paul Stamets proposes that mushrooms may be the Internet of the natural kingdom. The billions of drifting spores produced by decentralized and redundant networks of mushrooms contain unique genetic information, akin to that of the bits and packets that transmit information across virtual networks. Biological mushroom networks are an example of complex dynamic interrelationships of matter and information, pointing toward a future of responsive embodied networks. The furniture suggests a future in which responsive materials are grown rather than manufactured, adding valuable material to local ecosystems at the end of their life. 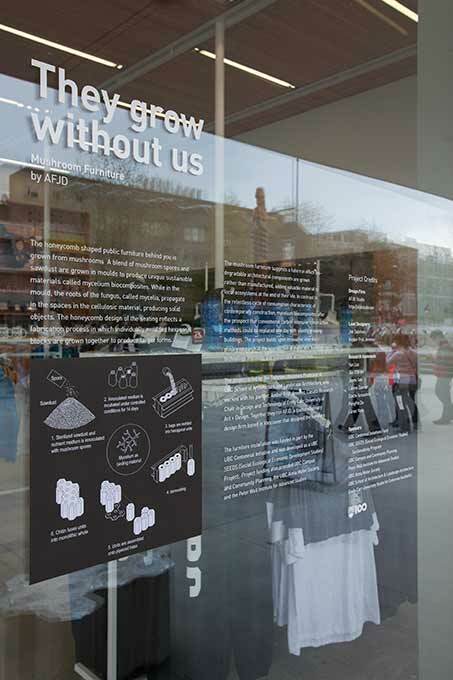 In contrast to the relentless cycle of consumption characteristic of contemporary society, mycelium biocomposites offer the prospect that conventional carbon-intensive design methods could be replaced one day with silently growing products. 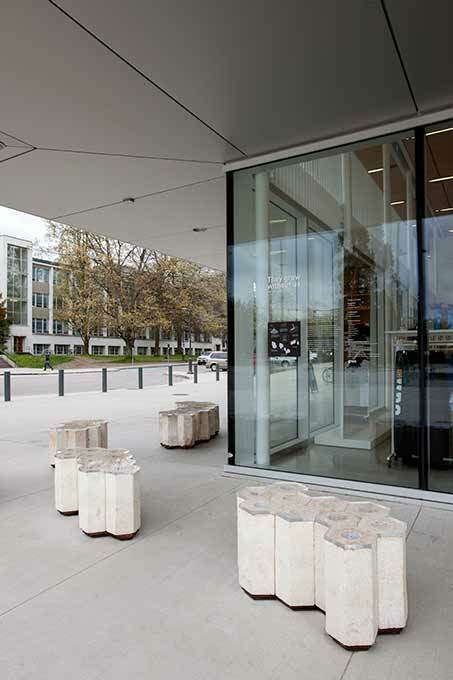 The installation was commissioned by UBC Campus and Community Planning as part of the UBC Centennial Initiative in the area of sustainability. Funding for the project has been provided by UBC SEEDS (Social Ecological Economic Development Studies), UBC Campus and Community Planning, the UBC Alma Mater Society, and the Peter Wall Institute for Advanced Studies.